Your business plan should be an action guide on how you plan to run your business. It should be written in a concise manner that will enable any banker or investor to completely understand your business concept. Your local library Your library should have resources available to assist you with the development of your business plan. Most libraries have online sites now and many enable you access to valuable research databases if you have a library card. Some libraries even give you access to expensive business plan software as long as you use your library card for access. This alone can save you hundreds of dollars! Depending on the software, they usually have the option to download the template into Excel or Word for editing purposes. As you develop your business plan, ask yourself a few questions. Answering these questions initially will start the foundation of your business plan. These questions require thought and research and your local library can give you assistance in this area. Who represents your customer base? What products or services do you plan to sell? How will you approach marketing for your business? When will you start or launch your business? How will you get financing for your business? What type of entity will you be? A great resource to use to get information on your type of business would be Reference USA. Access to this database is offered at many libraries as long as you have a library card. This database can answer questions regarding your customer demographics, competition statistics, sales data, etc. You can even use this data when you are developing your marketing portion of your business plan. 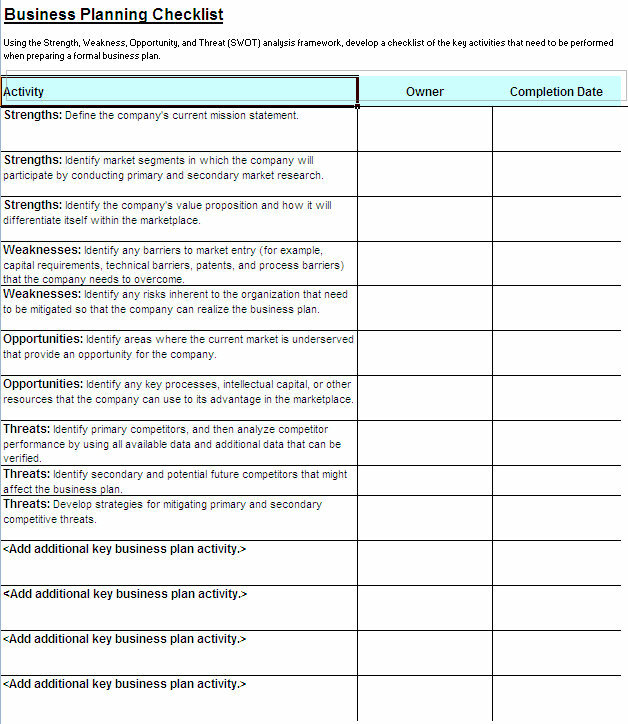 Use the excel business planning checklist template on the left to define your business’s SWOT: Strength, Weakness, Opportunities, and Threats. The checklist that you have shown above can be a good basis or reference to those who are planning to create a business plan. The completion date that you have included may give them the determination to do the plan as fast and accurate as possible.